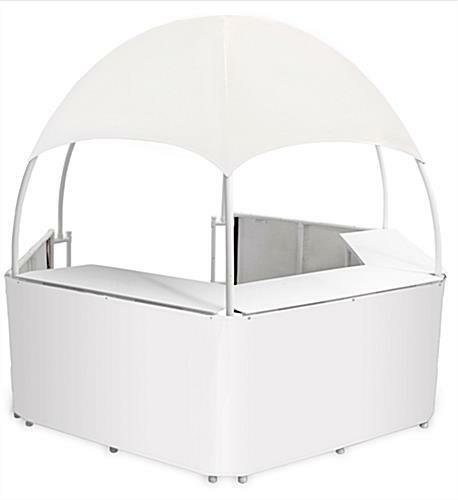 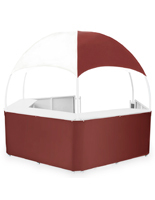 This white trade show gazebo is a classy yet functional display for businesses on the go. 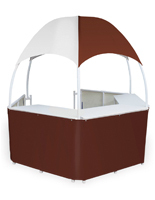 With a portable design that fits snugly into a set of heavy duty carrying bags, this pop up booth can be set up in just minutes. 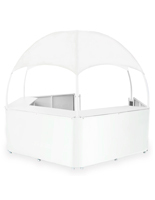 Made with heavy duty materials that can withstand the abuse of frequent travel, this canopy tent gazebo is a favorite among event vendors and rental companies. 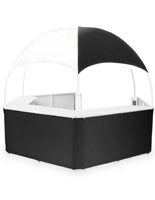 The wraparound counters are FDA approved, making this booth a stylish option for a concession stand at high end events like an outdoor wedding or golf tournament. 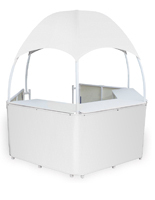 At 10’ wide, each pop up canopy tent can fit up to 4 staff members inside. 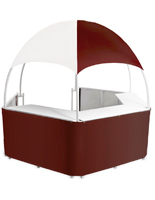 Transition to a more portable display booth with this gazebo for your next event. 55.0" x 38.0" x 19.0"